This extremely hardy, versatile plant has rosettes of aromatic feather-like leaves that are lacy and a rich green. Dense spreading mats are formed by underground rhizomes which makes it an excellent substitute for a lawn. 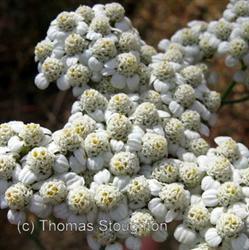 White, umbellate flower heads form in clusters which makes a great landing area for bees and butterflies. This plant has a myriad of uses including; as a groundcover, lawn substitute, in wildflower gardens, along a walkway, in perennial borders or under oaks. The possibilities are endless. The flower heads may be used in arrangements. If picked and dried quickly, they can be used for a dried flower arrangement. The leaves can be used as a salad green. Yarrow is a historically important medicinal plant with a wide variety of uses such as; snuff, poultice, wound dressing, astringent, antidepressant, stimulant, antispasmodic, fever reducer, blood pressure reducer, perspiration inducer and baldness prevention for centuries.